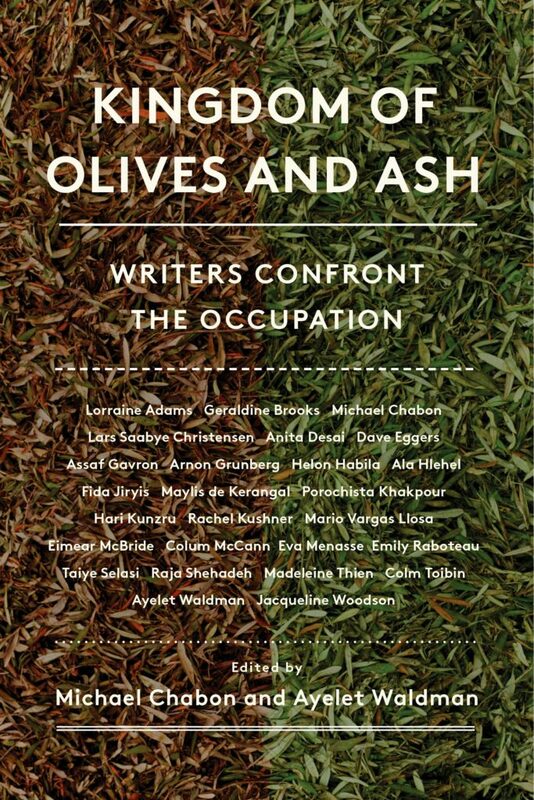 In Kingdom of Olives and Ash, Michael Chabon and Ayelet Waldman, two of today’s most renowned novelists and essayists, have teamed up with the Israeli NGO Breaking the Silence—an organization comprised of former Israeli soldiers who served in the occupied territories and saw firsthand the injustice there—and a host of illustrious writers to tell the stories of the people on the ground in the contested territories. This groundbreaking collection of essays by celebrated international writers bears witness to the human cost of fifty years of Israeli occupation of the West Bank and Gaza and includes contributions from today’s most esteemed storytellers, including Colum McCann, Jacqueline Woodson, Colm Toibin, Geraldine Brooks, Dave Eggers, Hari Kunzru, Raja Shehadeh, Madeleine Thien, Mario Vargas Llosa and Assaf Gavron, as well as Chabon and Waldman. For questions about your local book talk, contact the related venue. For all other questions or to get connected locally, click here. top writers bear witness to oppression and despair. . .
Moving, heartbreaking, and infuriating. . .
and sponsored by Harper Perennial and the New Israel Fund. Tour partners include Congregation Beth Elohim, the Brooklyn Library, Temple Sinai, Politics and Prose, the Bay Area Book Festival, IKAR, Temple Beth Zion, and the San Francisco JCC. Breaking the Silence is an organization of veteran combatants who have served in the Israeli military since the start of the Second Intifada and have taken it upon themselves to expose the public to the reality of everyday life in the Occupied Territories. We endeavor to stimulate public debate about the price paid for a reality in which young soldiers face a civilian population on a daily basis and control its everyday life. HarperCollins Publishers is the second-largest consumer book publisher in the world. Harper Perennial is one of the paperback imprints of HarperCollins in the United States. We publish paperback originals and reprints by authors like Ann Patchett, Justin Taylor, Barbara Kingsolver, and Blake Butler. The New Israel Fund is the leading organization committed to equality and democracy for all Israelis. Widely credited with building Israeli progressive civil society, we have provided millions of dollars to more than 850 organizations since our inception in 1979. This event is part of New Israel Fund’s campaign, 50 Years of Occupation: Time to Take a Stand. The Occupation is an enormous problem and there is no chance it will be addressed if it is pushed out of view. Supporting Israel in our day means supporting those Israelis committed to keeping the Occupation on the public agenda and to pressing for a better future.